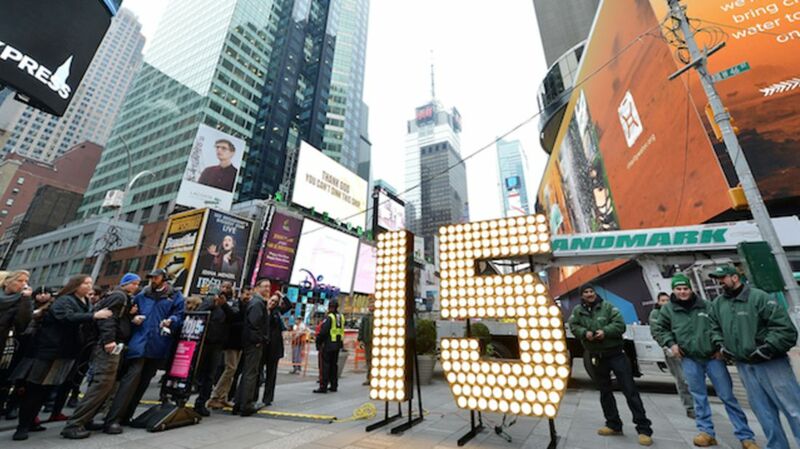 Tonight, over a million revelers will pack into New York’s Times Square to watch 2014 turn into 2015. The festivities will be marked by the descent of 2688 crystal triangles and 32,256 lights that comprise the iconic New Year's Eve ball, which has its own Twitter account with more than 15,000 followers. So before the champagne starts flowing and the countdown kicks off to a proverbial clean slate, let's take a look back at the history of this annual celebration. How did Times Square become “Times Square”? But What About The Ball? New York rang in the New Year with fireworks as 1905 turned into 1906, and again as 1906 turned into 1907. But then, in 1907, the city banned the fireworks display for safety reasons, and Ochs had to find a different means to signify the city’s annual rebirth. In a January 1, 1908 article, the Times commemorated the event: “At ten minutes to midnight the whistles on every boiler in Manhattan, the Bronx, Brooklyn and the waters thereof began to screech. Tens of thousands stood watching the electric ball and then—it fell.” The new ceremony was chosen to mimic the ball drop at the Royal Observatory in Greenwich, England, which has signaled 1pm for Londoners and ship captains on the Thames since 1833. There, the object of focus is a simple bright red ball. But for Times Square, Ochs commissioned something a little more elaborate: a behemoth 700-pound wood-and-iron creation, five feet in diameter and illuminated by 100 25-watt bulbs. It was built by Russian immigrant Jacob Starr while he worked for Benjamin Strauss in a family-owned sign making company, Strauss Signs. Strauss and Starr later formed Artkraft Strauss, which produced the ball drop up through 1996. The ball drop in Times Square on New Year’s Eve has been a remarkably consistent tradition since that first voyage on the precipice of 1908—with two notable exceptions. The New York Times noted the melancholy of the event’s first absence: “New Year’s Eve in Times Square had a weird quality last night …There was a note of sluggishness, an absence of real gayety. The restless thousands lacked zest. War somehow laid its hand on the celebration and tended to mute it. At midnight, the crowd watched in vain for the glowing white ball to slide down the flag staff atop the New York Times tower.” That was the story on January 1, 1943, after a wartime dim-out on lights replaced the glowing orb and a respectful moment of silence hung heavy in place of cheers or jubilation. A similar story the following year noted another New Year's darkened by the War. The iconic symbol has seen several upgrades through the past century-plus. In 1920, an entirely wrought-iron version lobbed 300 pounds off the original weight. Aluminum got the heft down to roughly 200 pounds in 1955. The same aluminum construction got a makeover in the early 1980s, when red lights and a green stem turned the classic orb into a Big Apple in accordance with the “I <3 NY” campaign. A short-lived white ball sat at the center of the ceremony from 1987 through 1998, during which time computer controls replaced manual labor. Waterford Crystal designed the Millennium Ball for the 2000 ceremony, which has undergone aesthetic adjustments each year since. As for One Times Square, the original raison d'etre of the whole shebang? The New York Times outgrew the building in 1913 and these days, apart from a Walgreens on the first floor and the offices of New Year's Eve production company Countdown Entertainment on the 22nd floor, the skyscraper is completely empty. But it remains the focus of the nation’s gaze on New Year’s Eve.